With over 250 seminarians at our Janiculum campus, the North American College is a large community. Fraternity and fellowship are developed and cultivated between many different groups: theology classes, diocesan brothers, hall corridors, universities, and the whole house. The academic year in Rome doesn’t begin until October, but that doesn’t mean the learning doesn’t start right away. Language studies, workshops, and a week-long silent retreat are on the schedule for August and September. The diaconate ordinations take place right before classes begin, and the year takes off from there. While Thanksgiving is not celebrated in Italy, the men of the College mark the day in suitable American style, complete with turkey and pumpkin pie. Christmas follows soon after, providing the seminarians with the chance to celebrate the season with the Holy Father here in Rome or the chance to travel abroad. The fall semester concludes at the end of January and is followed by a few weeks of final exams in February. Once the spring semester begins, Lent is just around the corner, with the annual tradition of the Station Church pilgrimages. Every other year, the College celebrates Holy Week in house. Holy Week of 2019 seminarians will be given the opportunity to celebrate Holy Week abroad while in 2020, it will be celebrated by the whole house at the NAC. Shortly thereafter, the end of the academic year is upon us. In May and in June seminarians find themselves preparing for another round of exams and planning summer assignments throughout Europe, the States, and other parts of the globe. Most New Men have class in the morning starting at 8:30 AM for four class hours. Classes will typically end around 12:15 PM with enough time to return to the house for pranzo, the large community meal for the day. A more detailed schedule will be given to you when you arrive. The College offers a comprehensive program to assist each seminarian on his particular journey of self-awareness and maturity. The four-year formation program is systematic and developmental in nature. Every year, three formation presentations are presented to each class and are designed to address specific topics and issues pertinent to the growth and maturation process of the seminarian in accordance with Pastores Dabo Vobis and the Program for Priestly Formation. The Pontifical North American College has a Director of Counseling Services as an integral member of its faculty. This position is held by a priest-psychologist/psychotherapist who offers several of the human formation workshops and presentations, while also functioning as the resident counselor for seminarians when human growth issues surface. To assist the seminarian, one external forum faculty member is assigned to be their formation advisor. Seminarians will meet with that advisor at least once a month. Each morning community Mass is celebrated at the College. The community also prays Morning and Evening Prayer in common. A weekly schedule, including liturgical events, is provided for students upon arrival. The text used at Morning and Evening Prayer is the four volume set of the Liturgy of the Hours as approved for use in the U.S. and Canada. The Sacrament of Reconciliation is provided by the in-house Spiritual Directors on weekday evenings during Eucharistic Adoration and on Sunday mornings before Mass. In addition, a priest from outside of the house is available to hear confessions on one evening per week. However, the College also has several spiritual directors who make themselves readily available. It is therefore almost always possible to find an available confessor. Students will have the opportunity to select a spiritual director from one of the in-house priest spiritual directors and are expected to meet with him for spiritual direction every two weeks. For more information, please see the College’s Spiritual Formation page. The academic programs at the three pontifical universities attended by NAC seminarians—the Gregorian, Angelicum, and Santa Croce—finish a general theology degree (S.T.B.) in three years of study. After this, students pursue a specialized degree (S.T.L. or S.T.M.A.). This generally takes two years but can be completed in one to three years of additional studies. For admission to the first cycle of Theology at any of the pontifical universities, a Ph.B. (approximately 70 credits in philosophy) is the norm. They will accept seminarians who come with at least 30 credits in philosophy as long as all required areas have been covered by an appropriate course (ethics, logic, metaphysics, epistemology, political philosophy, natural theology [philosophy of God], anthropology [philosophy of the human person], plus ancient, medieval, modern, and contemporary philosophy). Coverage of these specific areas is non-negotiable, although it may be possible for a student to make up a missing course concurrent with his theological studies. If you have any questions about the philosophy requirements, please contact the Academic Dean, Fr. John Cush, at jcush@pnac.org. Both the Angelicum and Gregorian Universities will generally accept prior credit in Latin (which must be two semesters for college courses, or four semesters for high school courses). The Angelicum and Gregorian will also generally accept credits in Biblical Greek, though depending on the circumstances, the Gregorian may require the student to test out of Greek or take the course. Previous Latin and Greek studies will be accepted on a case-by-case basis at Santa Croce at the discretion of the university dean. The Gregorian also tests all new, non-native Italian speakers on their proficiency in the Italian language. Following EU requirements, a student must test at a B1 level of proficiency. This testing takes place during the first semester. Those who do not pass the test will be required to take additional language studies before taking the test again. Students at the Angelicum whose first language is not English or Italian must also take a language proficiency test, generally scheduled during the first semester; those who do not pass the test will have to attend a language course. Although Santa Croce does not currently test students for Italian proficiency during the first cycle program, they do at the beginning of second cycle. The Pontifical University of Saint Thomas Aquinas (Angelicum) is the university of the Order of Preachers (Dominicans). A semester usually consists of an average of 20 credit hours divided between six to eight courses. The first cycle classes are available in English (one can also choose to take some classes in Italian). Class size is relatively small, with approximately 40 to 50 students in attendance. (Seminars in the second and third years usually involve fewer than a dozen students.) While classes normally follow a lecture format, comments and questions from students are encouraged. A student’s progress is evaluated by means of either a written or an oral examination at the conclusion of the term; some professors also administer examinations or assign term papers during the semester. In addition to exams, some professors assign term papers as part of the student’s grade for the course. The Gregorian is the university of the Society of Jesus (Jesuits). A semester usually consists of 20 credit hours divided between four or five lecture courses and a seminar. The first-cycle classes are conducted in Italian. Class size is relatively large with approximately 150 to 200 students in attendance. Classes follow a lecture format. Questions are usually not taken during class, but students are encouraged to ask questions before or after class or at some other suitable time outside of class. Students are graded by means of either oral or written examinations administered at the conclusion of the term. (These may be taken in a number of different languages, including English.) The seminar course, however, is available in English and in the first year is conducted at the NAC. The first year seminar develops many of the themes that are being taught in class and is a general overview of theology. Seminars involve regular written assignments to determine the student’s grade for the course. 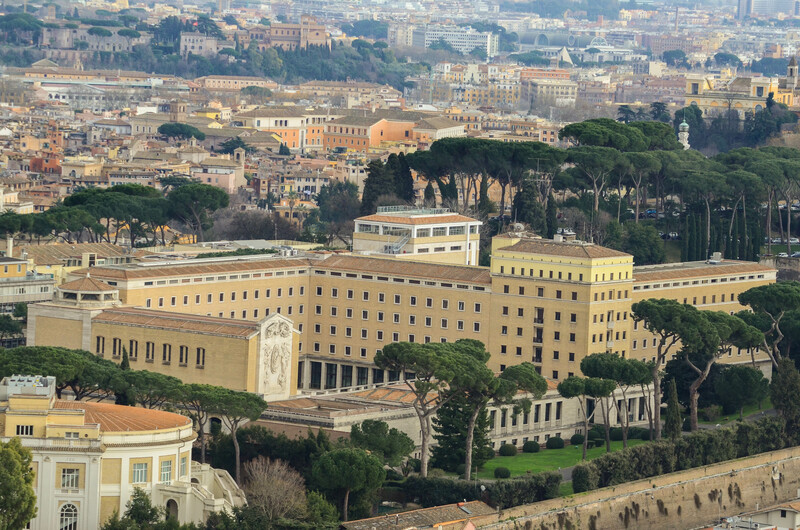 The Pontifical University of the Holy Cross (Santa Croce) is operated by Opus Dei. The courses of the first cycle aim at presenting an organic exposition of all of the Catholic doctrine, along with an introduction to the method of scientific research. The first cycle program, leading to the completion of the S.T.B. degree, has a duration of three academic years divided into semesters, and is concluded with the comprehensive degree exams. Each semester, students take six to seven classes totaling 20 credit hours. The classes are taught in Italian, although many of the professors also speak English. Classes are relatively small in size, approximately 40 to 60 students, and generally follow a lecture format with some student-professor interaction depending on the professor. Students are graded based on oral or written exams administered at the end of the term, although some courses also have periodic midterm exams or other course work. The North American College assumes that students will receive Candidacy before arriving in August. If this is not possible, please contact the Director of Admissions as soon as possible. Preparation for ministries and for other aspects of priestly formation is addressed on Thursday nights in the College formation program. During the first year, topics include public Lector training and preparation, the content and use of liturgical books and spiritual formation. Apostolic work is an important part of priestly formation. During November and December of the first year, students are encouraged to visit several apostolates and make a selection as to their preference. They are then assigned an apostolate for the second semester. Current apostolic work includes hospital visitation, catechism education, guiding pilgrims at Christian sites, street evangelism, work in soup kitchens, and homeless shelters. Students do not return home during the summer between the first and second years unless called home by their diocesan superiors. In the course of that summer, at least four weeks of apostolic activity or language study are required. Summer apostolic activity often involves work in a parish, in a retreat house, in the missions, or in military chaplaincy programs. Diocesan Vocation Directors will determine whether their diocese has special requirements for summer apostolates. For more information, please see the College’s Pastoral Formation page. The Student Activities Committee (STUAC) operates and provides funds for various student services and activities throughout the year. Student services will be available to students shortly after their arrival at the College. You may want to take a look at the facilities here at the College to determine what equipment or supplies you should bring. KNAC is a student-run store that has reasonable prices on often-used items, such as stationery and school supplies, toothbrushes and toothpaste, shampoo, tissues, shaving cream, razors, snack foods, American coffee, and cleaning supplies. While there is not as wide a variety of brand names as may be found at a local store, there is a good array of items at prices competitive with Roman stores. While KNAC does not carry everything a seminarian needs, it is a convenient option for many day-to-day items such as toiletries and snacks. Italian newspapers as well as The International Herald Tribune and USA Today are available in the Student Lounge. A television room is also available for DVD and VHS videos, and there is an extensive movie library. The lounge has a Foosball table, ping pong table, and two dart boards, and sells soft drinks, beer, snacks, ice cream, and other refreshments after lunch and supper every day. Also available are Vatican postage stamps, city bus tickets, and photocopy cards. The fifth floor student kitchen and patio are used for a variety of functions. The kitchen can be signed out by seminarians if they would like to cook a meal or prepare food items on their own. Food is easily purchased at grocery stores or outdoor markets nearby. The kitchen gets a lot of use for class dinners and other small meals and social gatherings. The college theater is used on a regular basis for formation and rectors’ conferences. It is sometimes used to show movies and is also home to the beloved New Man Show, the Old Man Show, and the NAC Play. The wood shop has been recently renewed and revitalized. It has many power tools and equipment and also a limited stock of wood for use in student projects. A number of students have constructed lofts, cabinets, and shelves for their rooms in the shop. Most wood can be purchased at nearby stores. The College campo sportivo (sports field) is used for a variety of intramural tournaments throughout the year. You may also bring any gear you like, such as cleats, rackets, etc. The NAC gym is used regularly. We have a new gym, which opened this March and is furnished with brand new equipment. Equipment in the gym includes free weights, universal machines, elliptical trainers, treadmills, stationary bikes, a rowing machine, and a leg press. Students employ their musical skills in both liturgical and non-liturgical contexts. There is a house choir which sings at Sunday Mass, Sunday Vespers II, and on feast days. Organists and singers are particularly encouraged to share their talents at liturgies. Annual events, such as the Christmas dinner and charity concert, also involve students’ musical talent. Students are encouraged to bring musical instruments, as there are many opportunities to use them at the College. Keep in mind that sheet music can be difficult to find in Rome. There are a number of seminarians here interested in the visual arts. Accordingly, a small room on the first floor has been set aside as an art room. Art supplies are fairly easy to find here in Rome, though expensive. We would recommend that you bring any of the more expensive or essential things that are easy to pack, such as brushes.